Matt and Jen married at Wyndham Grand to the Walt Disney World Resort, in Orlando, Florida. The beautiful event was celebrated by family and friends from all over the east coast; from New York to Florida. 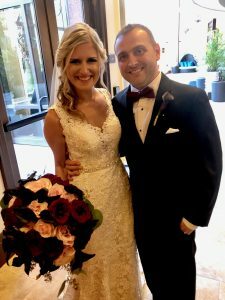 Matt wore a dark grey tuxedo with a stylish burgundy bow tie as he watch the approach of his lovely bride down the aisle in lace cover, form-fitting Vera Wang dress. Nicole from Pave Weddings took the vision of the couple and made it come to life with the amazing vendor team them assembled. Aaron with Fiora Design Studio took the crude drawing of the bride and made them pop off the pages of the sketch book into reality. The bouquet was filled with burgundy roses and dark florals and accentuated with just a touch of blush. White Rose Entertainment did an awesome job from providing the microphones for the ceremony to getting everyone on the dance floor and making the Rock! Dawn from Corner House Photography captured every moment of the day from the bride getting reach, the walk down the aisle, the first kiss, to the exit at the end of the evening. Rev.Glynn Ferguson with Sensational Ceremonies worked with the couple to create a unique and custom ceremony, just for them. From vows to readings they chose every details. Rev.Glynn also gave them a homework assignment and asked them to write and tell why they love each other. I love so many things about Matt that it is hard to just put it all in just a few words. I know that ever since our first date, when I look at him, I feel a joy in my heart that I’ve never known before. I love that he is so kind to everyone, he would do anything for his loved ones, and he treats me and Daisy like gold. He makes me laugh, he is interesting, he teaches me new things, he is talented and intelligent, and he has the biggest heart. I fall in love with him every day and I can’t wait to do so forever. It was an Incredible night! Congratulations Jen and Matt!! !